The theme for the all-brands 2019 Riding Into History show is “Celebrating The Great American Motorcycle” and this year’s Grand Marshal will be Gloria Struck. Gloria Struck started riding at age 16 and by 1946, at the age of 21, Gloria became one of the early members of the Motor Maids women’s motorcycle club. She has ridden over 650,000 miles on eleven Harley Davidsons and three Indian Motorcycles across America and parts of Europe. She is a frequent long distance rider to rallies for the Motor Maids Convention and the national Sturgis Motorcycle Rally. 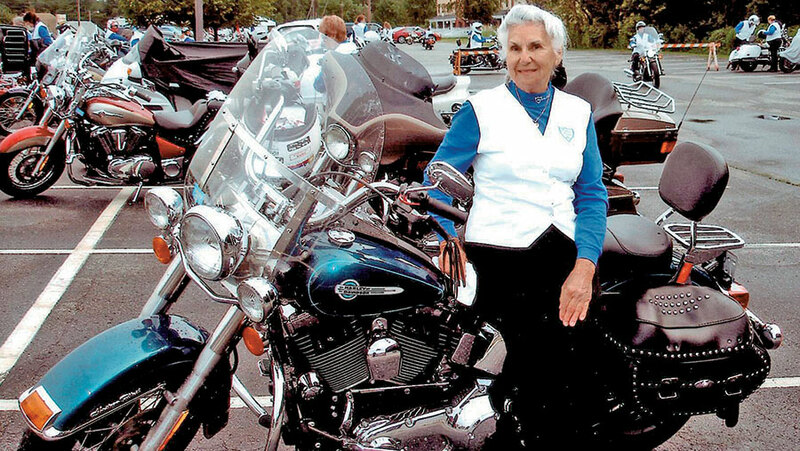 A member of the Sturgis Hall of Fame and the Motorcycle Hall of Fame, Gloria is well know around the country as an inspiration to both men and women riders. Gloria is as an enthusiastic motorcycle rider today at the age of 94 as she was when she started riding 75+ years ago. She has recently published her autobiography entitled “Gloria – A lifetime Motorcyclist: 75 Years on Two Wheels and Still Riding”. She tells us she plans on riding cross country for her 100th birthday and is currently traveling around the US promoting her book. She is well known as the matriarch of the woman’s motorcycle community and will be a very special quest to have as our first female Grand Marshal for Riding Into History on May 11, 2019 (which also happens to be Mother’s Day Weekend). Come out and join us for our 20th Annual Riding Into History event and meet Gloria who will be doing book signings as well as being our featured speaker at the Grand Marshal Dinner on Friday May 10th.